We are very excited to bring to you yet another year of Concert in the Vines! Thanks to everyone's efforts, last year we were able to raise another $20,000 for the rescue helicopter's operations in the region once again. These much needed funds go towards local operations and basing the helicopter in Whitianga. 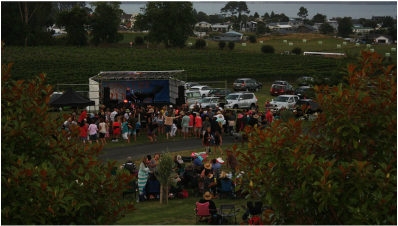 If you like summer, kiwi music and supporting a great cause, this event is perfect for you. Get your tickets online, or from Westpac Whitianga branch, Whitianga Isite, Pauanui Information Centre, Tairua Information centre and Mercury Bay Estate cellar door. Feel free to bring a blanket and picnic. There will also be food and drink for sale. Please do not bring any alcohol through the gates. Alcohol can be purchased on site.